In this post, we briefly explain some of the evidence that there’s far more labor market slack than is apparent from the unemployment rate alone. The unemployment rate doesn’t capture workers who, because of a difficult job market, have stopped looking for work. The labor force participation rate – the share of the population that is either working or actively looking for work – dropped off sharply during the recession, from about 66 percent to about 63 percent. While some of those folks left for retirement, others–maybe a third to a half by some measures–can be enticed back into a more welcoming job market. A number of prime-age workers (those between age 25 and age 54), for example, have dropped out of the picture. 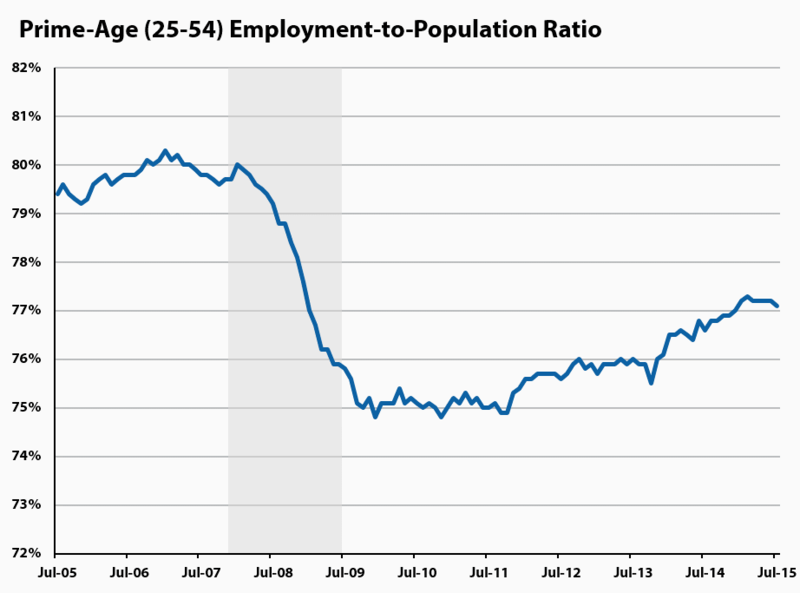 The figure below shows the employment-to-population ratio for workers in this age group. Notice the five-percentage-point plunge it took during the recession; while it has nudged back up to just over 77 percent, it is still three percentage points beneath its pre-recession level. 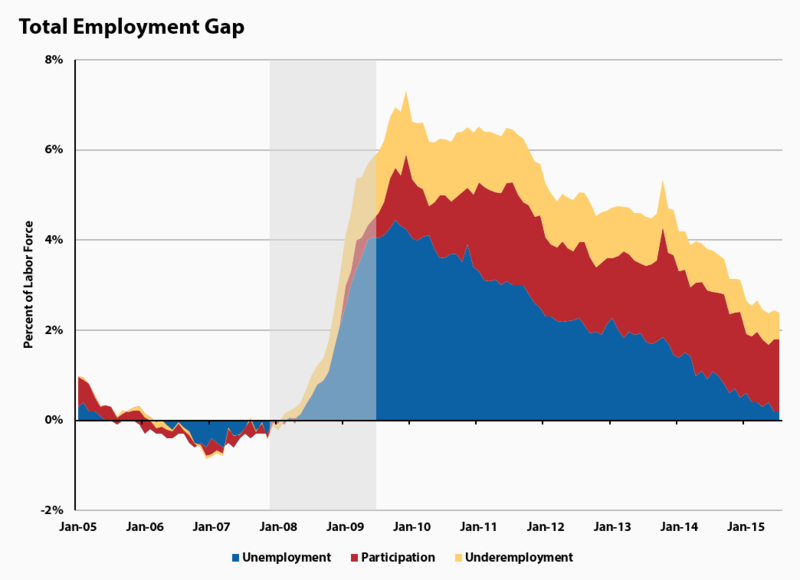 The “total employment gap,” developed by economist Andy Levin, is another indicator of the amount of labor market slack. The total employment gap accounts for three populations of potential workers: the unemployed (who are actively looking for jobs), those who have left the labor force but could potentially come back into it, and the number of workers with a part-time job who would rather have a full-time position. Using high-end estimates of the “natural” number of workers in each category (see data note below), we estimate that the total employment gap is at least 2.4 percentage points. Source: Our estimate of Levin’s gap measure. It is therefore unsurprising that we’ve yet to see much in the way of wage growth–while the job market is steadily improving, we aren’t yet at full employment. It is essential that policymakers keep these broader measures of labor slack in mind. Data Note: The Levin gap measure relies on estimates of the size of the “potential” labor force and the “natural rate” of unemployment from the Congressional Budget Office, as well as an estimate, based on the pre-recession trend, of the “natural” number of full-time-equivalent involuntary part-time workers. Share the post "Two up-to-date pictures of labor market slack"
3 comments in reply to "Two up-to-date pictures of labor market slack"
Well, looks like the employment to population ratio is going up about 1/2% per year. Only 5 more years to go until full employment, yay. Note that 2006-07 when these measures were negative inflation did not accelerate. The CPI rose 3.37% in 2005,some 3.22% in 2006 and 2.87% in 2007. I think a serious look needs to be taken at the arbitrary cut-off that qualifies someone for being considered part of labor force. The search must have been “active” within the past month. This very much puts a thumb on the scale for policy purposes, allowing for a much lower published unemployment rate than the U-6, which actually pays attention to what people say and counts anyone who says that a job is desired and he or she is available for work. It’s not easy to understand why one month was used in devising these measures except as a way to stack the deck to make the U-3 “official” rate look as good as possible — with the government in power and bankers eager to concentrate solely on fighting inflation and keeping wages low as the beneficiaries. For someone who has been unemployed for a long time, it’s hard to go back to same base of potential employers for the fifth time, but the person is every bit as unemployed as the person who found something worth applying for recently. Merely checking newspapers or the internet apparently are not considered sufficient to constitute an active search under BLS procedures, and yet nowadays the online databases are far more comprehensive and maintaining a frequent lookout for when your field seems to be opening up and for something you can apply for may be the only thing worth doing. But that person is every bit as much unemployed as someone who knocked on a door within the past four weeks. This analysis seems virtually identical to the U-6. Is there some reason why the “U-6” is a dirty word, and you have to pretend you are doing some kind of fresh analysis? The current difference between the best U-6 seen since the measure was introduced by BLS (6.9% in a two-month period in 2000, which was the only time we had something that felt close to full employment) and the current U-6 (10.4%) is 3.5 percentage points; that would be roughly equivalent to six million jobs. It’s also hard to see how one can imagine there was negative slack in 2006-2007 — during the “jobless recovery” with its relatively high involuntary part-time figure, fairly high U-6 (8.4%) and lower-than-best-ever employment-to-population ratio (63.4% vs 64.7% in 2000, representing a difference of about 2.1 million jobs) — but acknowledging a gap of 2.4% is at least a good start.